When was the last time you were late for a date? Or you were not exactly sure where your kids where roaming? Or you were waiting for your friend to show up. This happens weekly and sometimes daily to me; probably to you too. I bet some of you are reading this blog on your phone or iPad — we are carrying these wonderful gadgets with us, they certainly help to make us reachable, sometimes even 24/7, but that doesn’t mean that we’d be in the right place at the right time. In August last year they launched a free mobile app called Lokki that helps you to know where the people in your life are going. If you know the world of Harry Potter, think about the Marauder’s Map, you see the map and places, and everyone moving on the map. Sounds cool — and a bit creepy. 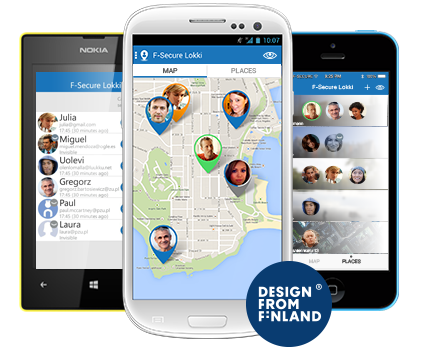 Since we at F-Secure take your privacy seriously, we added a simple button to Lokki so that you can hide your location from others, anytime you want. Kind of like the Marauder’s Map with Invisibility Cloak built-in. How cool is that? So, how does it work and why should you try it? You can install Lokki to your phone or tablet, sign up with your email address and start sharing your location with your friends or family members as soon as they have Lokki in their phones. Lokki is a free app and you don’t need to subscribe to any kind of a plan. If you for some reason decide that you don’t want to continue using Lokki, just uninstall the app and it’s gone. No strings attached. There’s some nifty location apps for the iPhone and some time ago Google ramped down their legendary Latitude for Android devices. However, in real life you don’t really select your friends or family members based on the phones they use. Your friend has a glossy iPhone, your spouse has an Android and your kids may have colorful Nokia Lumias running the Windows Phone OS. That’s why we made the Lokki app available for all of these major smartphone platforms. The phone camps do not matter any more, Lokki works across the board. You can get Lokki from the Apple App Store, Google Play and Windows Phone Store. Being a security software house does not mean we make apps for the Big Brothers. You give the permission to others to see your location. Your location in Lokki is visible only to these people, not to the whole world. Lokki is respectfully liberal so you can anytime switch off your location sharing. Also your kids can do that. If you find this to be inconvenient, please do have a discussion about that topic with your family members. It’s good to talk with them anyway! Lokki does not store or share your location history. We only store your most recent location. Your data is securely stored in our Lokki servers that are physically located in the European Union. Oh, and by the way, you will not see ads in Lokki and we are not sharing your usage data with any third parties. We also built Lokki so that you cannot share your exact location to Facebook or other social media sites. We were thinking kids here. If you absolutely want to share your location with the whole world, we are sure you can find ways to do that. We talked to a number of people when developing the initial ideas for Lokki and one of the themes we heard was that quite a many people said they don’t want to see dots on a map, either because they don’t know how to read a map or because their friends are travelling all over the world, and a world map doesn’t really make sense. Therefore, we built Lokki so that you can choose to see either the people dots on a map, or you can create your favorite places in Lokki, and when your friends or family are in these places, Lokki will show that to you. You can choose if you prefer the Map or the Places view or you can jump between these two. It’s your choice. Hands up who has never lost his or her phone! With Lokki you can easily locate a missing phone or iPad. Even if the battery has died, Lokki will still show you the last known location of the device. We’ve used quite a many location sharing apps over the last year or two. Some of them are pretty cool but eventually useless because they are real battery hogs. Our first versions of Lokki were reporting the phones’ location every 5 to 20 minutes to our secure server but we found that to lead to too high battery consumption so in the new 3.0 version of Lokki we redesigned the location reporting. Now Lokki reports the phones’ location when someone in your Lokki circle is asking. You can see your own current and accurate location on your own Lokki screen whenever you have Lokki up and running, but when the Lokki app is not on your phone display, it does not report its location to our servers unless someone else in your Lokki is requesting the location. If the Lokki server notices that you have not been reporting your location in one hour, it’s often because you may have switched off and on your phone, and in the iPhone or Android applications may not automatically start after the phone wakes up, so then we are sending a location wake-up query to Lokki in your phone but we don’t do this more often than once per hour. It does not make much sense to drain the battery to communicate with the GPS satellites if nobody is interested.